HOLIDAYMAKERS are being warned to behave after a court case in Greece in which a local woman was accused of setting fire to a British tourist after he allegedly groped her in a bar. Britain's Travel Association ABTA will urge British holidaymakers to "appreciate local customs", after the woman charged with assault was hailed as a hero by locals who are fed up with rowdy British holidaymakers who have earned a bad reputation because of drunken behaviour. An ABTA spokeswoman said: "We are putting together a letter, outlining advice which will be distributed to holidaymakers in particular resorts stating that they must appreciate local customs and law – otherwise they will face arrest." The Greek woman, a 26-year-old student, said she poured the sambuca – a highly flammable drink – over Stuart Feltham, 23, from Swindon, Wiltshire, after he pulled his trousers down in front of other women and made inappropriate advances towards her. In court, her lawyer said: "He fondled my client's breasts and buttocks and she poured her drink over him and left." An ABTA spokeswomen said: "We are in the holiday business and we want people to have a good time but we don't condone this kind of behaviour. We want to encourage people to have responsible holidays. We know we have a part to play." Officials on the Greek islands of Zakynthos and Crete are seeking to curb inappropriate behaviour by British tourists, while the British Ambassador to Greece, Simon Gass, visits local authorities to discuss the problem. During his visit to Zakynthos, Gass said: "If you have a resort in which there are very large numbers of bars selling very, very cheap and often low quality alcohol in very large quantities you can't be that surprised when you get an awful lot of people who end up drunk." SCOTLAND'S thin blue line is getting whiter. The proportion of black officers in the nation's police forces tumbled last year amid one of the biggest recruitment campaigns in history. Some senior officers now believe that would-be ethnic minority recruits are being put off joining up by stories of racism in the ranks and claims of "robust" policing of Muslims following the Glasgow Airport bombing. Forces aspire to have roughly the same demographic make-up of the communities which they police. Just over 2 per cent of Scots are of a black or other minority ethnic (BME) background. No Scottish force, however, has managed to get close to that figure. Strathclyde Police, the nation's biggest, yesterday admitted just 1.28 per cent of its officers were BME as of 31 March, 2009. That is down from 1.74 per cent a year before. The overall number of such officers fell from 129 to 102. The vast majority of new recruits funded under the SNP government's drive to boost police numbers by 1,000 over the period of the current parliament have been white. Insiders said the new recruits had "diluted" the police forces, making them whiter than for some years. A spokeswoman for SemperScotland, the body that represents black and minority ethnic officers, said at least two of the recent passing-out parades from the national police college had contained no black or minority ethnic recruits. The low recruitment figures come after complaints, especially from Muslims, about policing in the aftermath of the Glasgow Airport bombings. Pakistani and Afghan groups have protested over the way they are questioned at airports, with Special Branch officers regularly quizzing Asian-looking passengers about their views on Islam and terrorism. Another insider said: "I blame the Secret Policeman show, the BBC investigation. They exposed locker-room racism and that has made it far harder to convince some people that things have changed, but they have." Semper's vice-chairman Baseem Akbar, a Scotland-based sergeant in the British Transport Police, yesterday said: "The negative perceptions of the police still exist in some people's minds, unfortunately. 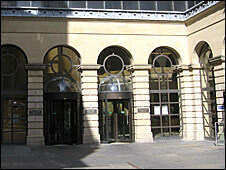 Edinburgh Sheriff Court, 20 Nov 2009.
the sale of his dog fell through. Melbourne was seen in the area shouting to residents “come and have a go” and threatened to petrol-bomb a flat. Witnesses then saw Melbourne banging on a door in Saughton Mains Terrace shortly after in an “aggressive and highly intimidating manner”, Edinburgh Sheriff Court heard. The incident took place some time between 23.00 GMT and 00.30 GMT on Friday 16 October 2009. The defendant's brother William Melbourne and Dean Alexander Smith, who were present during the confrontations, were acquitted of similar charges. David Melbourne has a previous conviction for assault in April 2009 following a affray on a bus. He was ordered to carry out 60 days community service. Sheriff Neil MacKinnon QC ordered background reports in the hope that external agencies can help shift Melbourne from a “life of revolving crime”. “I am concerned that at just 21-years-old you already have a string of offences. “You must sort out your life if you wish to avoid a lifetime in-and-out of prison. To do this, you need help. The Sheriff told Melbourne to “put the event behind him”. Sentence has been deferred until 18 December 2009 following background repoorts. I do not want to punish you. I want to help you.